I love to cook all the time. However, when I am really stressed, I sometimes overdo it...a bit. 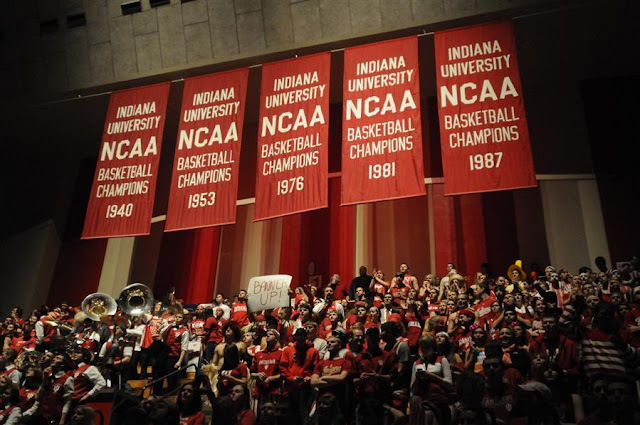 Last week, Indiana University made it to the Sweet Sixteen in the NCAA Tournament. I was home for spring break for the previous games against New Mexico and VCU. My mother couldn't wait to get me out of the house. Mom's mantra for the week was "Deerfield is not a college town, and you can't scream with all the windows open in the house." But Mom, this is INDIANA! Unfortunately, she is not a Hoosier and did not quite understand the concept. Hands down, one of my favorite memories at IU will always be watching Watford hit the 3 in the last seconds to beat Kentucky. Our unranked program, beat the #1 basketball program in the nation. Thus, I was completely on edge the entire week awaiting our fate when Indiana and Kentucky would meet again in the Sweet Sixteen round. The game was at 9:45 at night. My day ended up consisting of making: Roasted Tomatillo Salsa (this recipe), Hummus, Cheese Pretzels, and Barbecue Wings. Thankfully I was cooking for a house of guys, who definitely appreciated it. Even with the nonstop cooking action all day and completely exhausting myself, I could barely watch the game. Every basket made or missed, we edged even further onto the edge of our seats. Everyone had different ways to deal. Some paced, some had to leave the room, some yelled at the refs and I buried my head in a pillow. I had never felt so tense before. Even though, Indiana did not go on, we gave Kentucky a run for their money. I am so proud of everything Tom Crean has built back for our basketball program. I'll always be an avid Indiana Basketball fan, even when I'm not living in Bloomington next season. Thanks for a great four years and showing the country what potential the Indiana Hoosiers have in years to come. This is Indiana. BANNER UP! 1. Heat oven to 500 degrees. Place tomatillos, garlic, jalapenos and onion in an ungreased baking pan. Cook stirring once, or twice until vegetables are charred about 15 minutes: set aside to cool. Remove stems(but not seeds from peppers: discard. Peel garlic. 2. Transfer ingredients to a food processor; process until coarsely chopped. Transfer to a medium bowl; stir in lime juice, cilantro, olive oil, sugar, salt and pepper until well-blended. Salsa will keep, refrigerated, up to 4 days.